Our weather has suddenly turned really cool, even “nippy,” and it’s just the perfect weather for soup! In our family we have two soups that are favorites, and it would be impossible I think to make any of us choose THE favorite because we like them both so much. One is a potato soup that my great-grandmother (and my father) used to make… I made the other favorite, minestrone, for our supper last night. The recipe for the minestrone soup came from a petite French-Canadian lady who cooked for her own Italian restaurant. And no, the Italian is not a typo! Bring everything to a boil, then simmer until the cabbage and other vegetables are almost cooked. Add 1/2 cup uncooked pasta and simmer again until the pasta is done. We prefer spaghetti broken into small pieces. I always make huge batches of this soup and freeze the extras. It is really a delicious soup. I love that title. Very clever! Soup looks good too. That soup looks delicious. Thanks for sharing the recipe. My mother in law makes minestrone. Hers does have corn in it. No carrots tho. I laughed out loud when I read the title of this post. We have a Chinese restaurant here (France) run by a Greek family so I know where this recipe is coming from. Their food is great and this soup sounds and looks delicious too. Thank you for this wonderful blog. 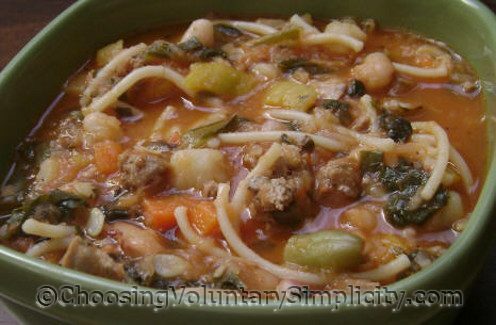 Minestrone soup is one of my favorites too! I usually add lentils and peso ala the Italian man who owned the Italian restaurant (imagine that!) in a town near where I used to live in Oregon. Are you going to share the potato soup recipe too? Mmmmmmmm. I can just smell that soup! And a nice crusty loaf of homemade bread. Thanks, Shirley! Just what the doctor ordered for this chilly weather.